Summer has arrived rather late this year. Last month, Toronto has gotten a lot of rain, random thunderstorms, cloudy days, even hail fell from the sky (golf ball sized ice cubes!). I've been performing several rituals to make summer arrive faster, including gulping down papaya lassis, sipping on strawberry milkshakes, and feasting on watermelon slices...apparently these are not scientifically proven methods. Only after midsommar, the official start of summer, has the sun decided to come out and play. Let's hear it for bikini weather, for shirtless jogging men, for big scoops of ice cream, and for backyard barbeques! Some folks may retreat from the kitchen at this time of the year, but I switch on the oven and bake. 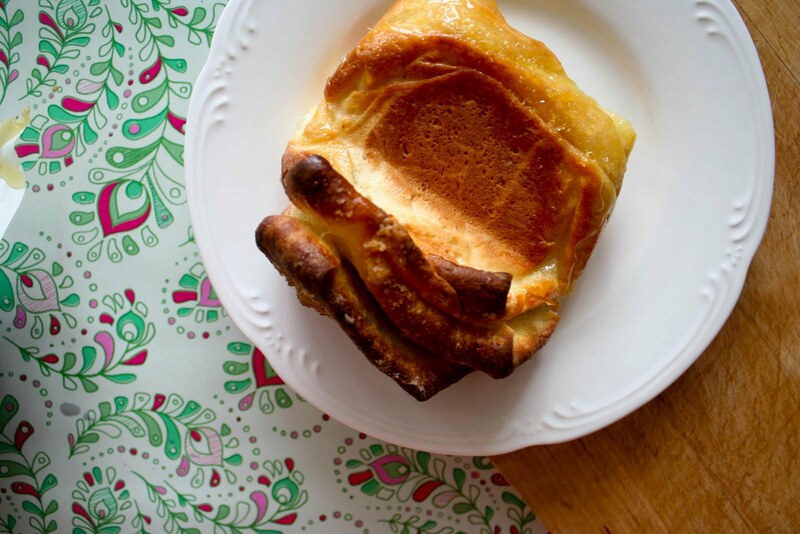 I revel in having my arms elbow deep in flour, kneading and shaping dough, stirring batter, zesting fruit, yanking open a hot oven to bake a gratin, or whatever suits my fancy. I don't mind the heat. Then again, I spent almost a decade in Shanghai, where the summers can climb up to 39°F and I still play tennis outside. Heat and humidity doesn't bother me, lightning and thunder does. 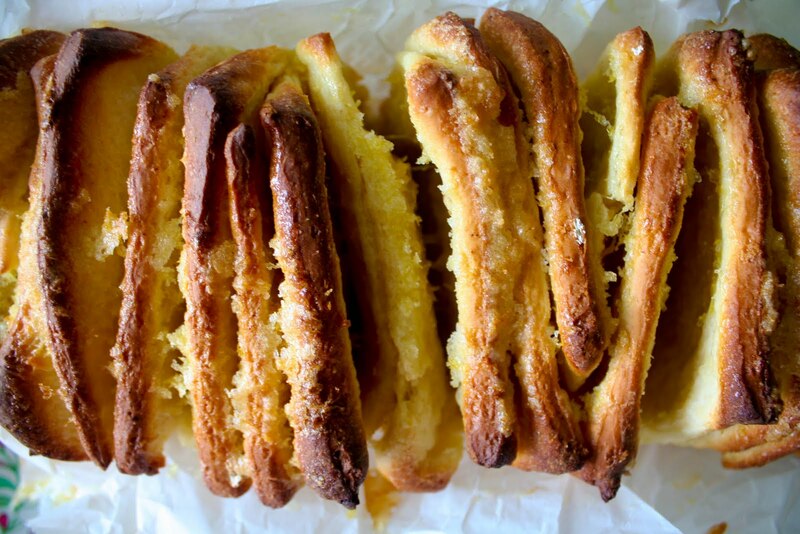 There's been a little hype of this lemon pull-apart bread in the blog world. 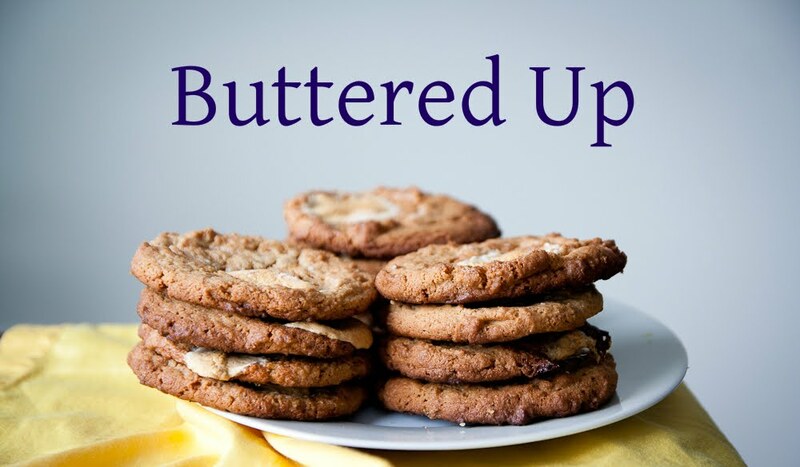 The recipe is originally from Leite's Culinaria and then experimented by Hungry Girl por Vida and Joy the Baker who tried a cinnamon sugar version, I stuck with the lemon version because I can never say no to citrus flavored anything. The bread is fun to make. The only sad thing was the absence of an orchestra, tap dancing or fireworks when I took it out from the oven, because it really deserved a grand welcome. 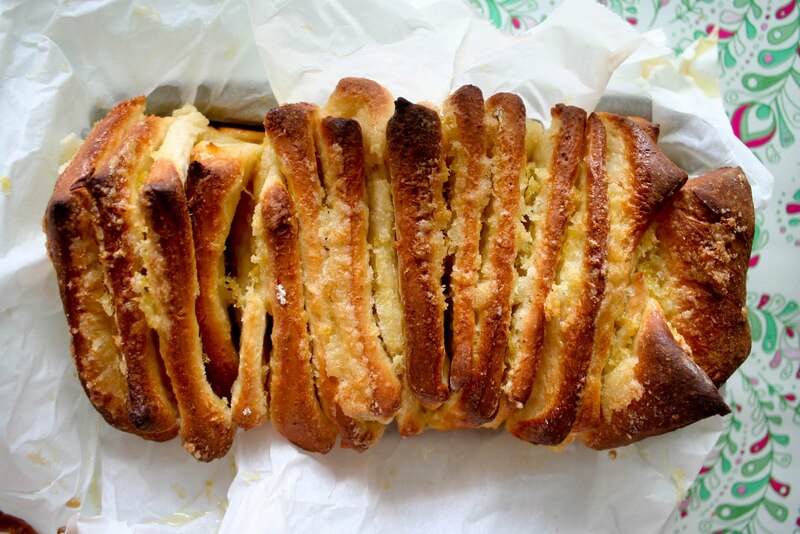 It's a beautiful bread, caramelized layers emerge from the loaf pan, liquid sugar drips onto the parchment paper, and lemony smells waft the apartment. I skipped cooling the bread (why would anyone bother waiting? ), peeled off a slice and popped it into my mouth. Sugar crystals dissolved on my tongue like candy, yielding soft bread with a big punch of citrus. It even makes Monday mornings bearable. I've included the recipe here and documented the preparation process to show you how it's done. The steps look long, but don't let that frighten you. First, make the dough (this part is dead easy), it should look smooth. 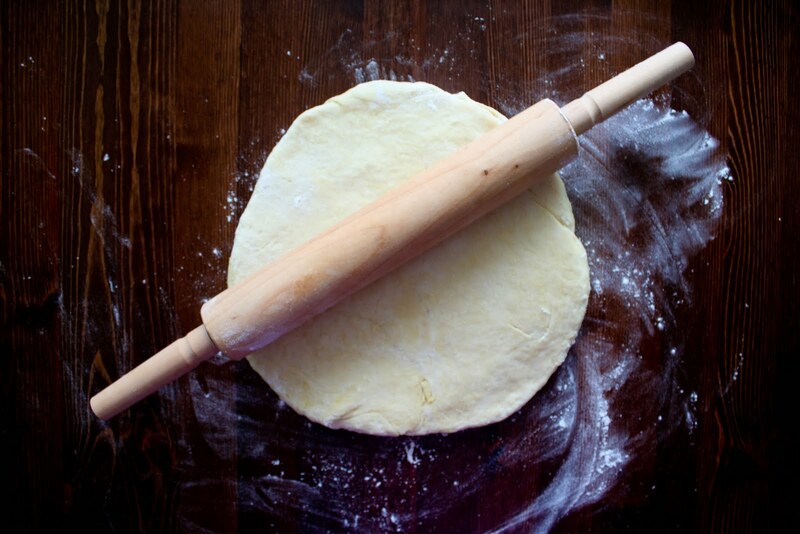 Kiss it goodnight and put it to bed in the fridge (or if you're an eager beaver, go ahead and roll out your dough). 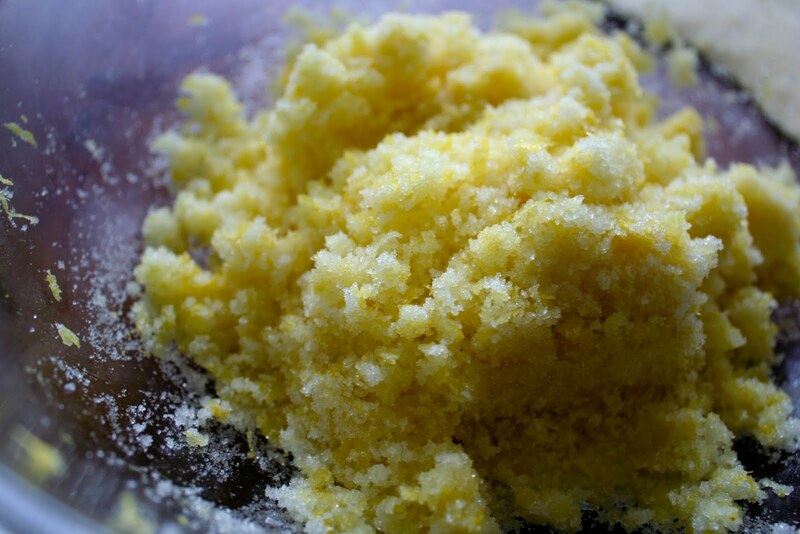 In the morning, make the lemon sugar. 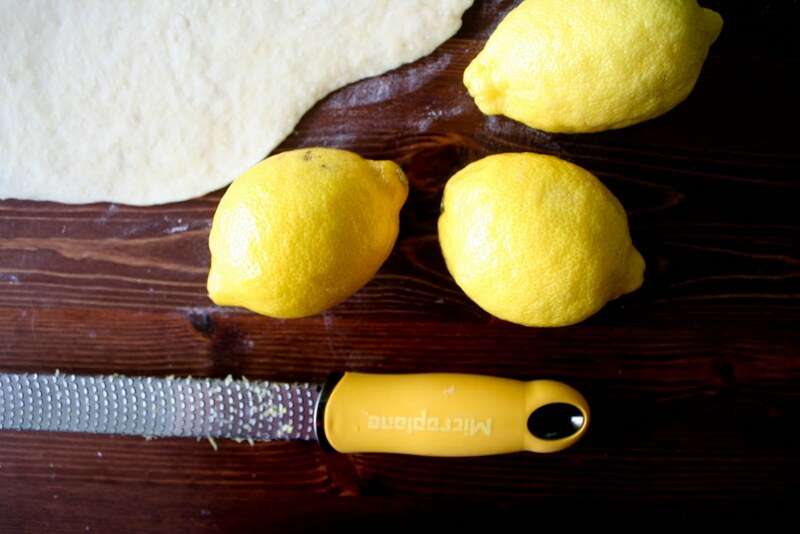 Zest lemons and be careful not to grate your hand, you must ensure you are wide awake (though the sensation of cutting yourself should awaken you anyway). Add the sugar. 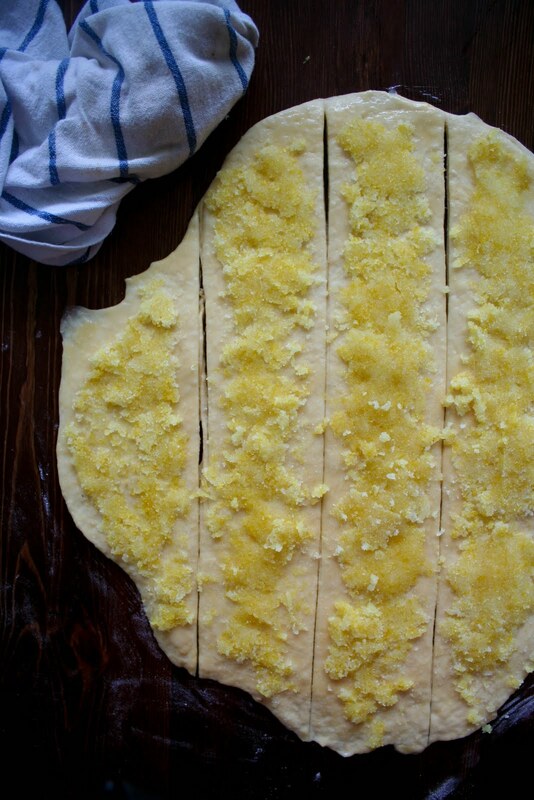 Roll out the dough, brush with melted butter, cut into 6 strips. 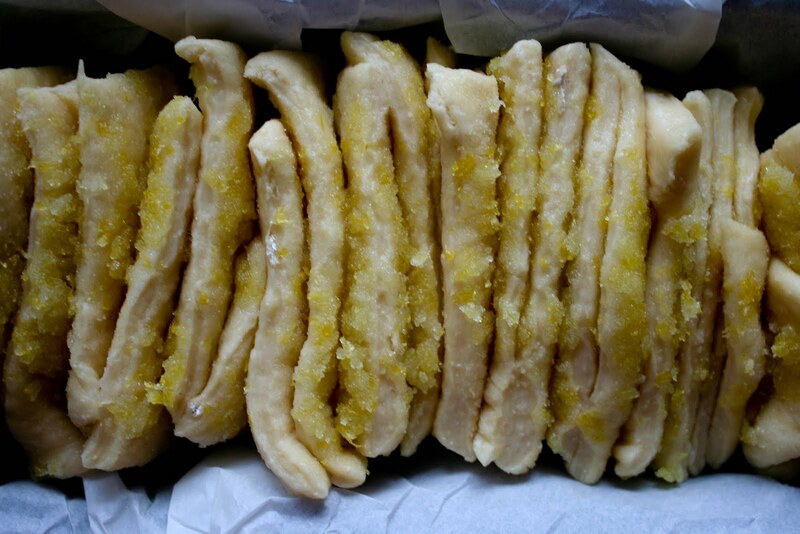 Spread lemon sugar over each strip, and stack each strip on top of each other. Cut into 6 individual stacks, lay into loaf pan with the cut side down. Allow to rise in warm place for 30-45 minutes (OMG! MORE WAITING!) and bake in preheated oven for 30-35 minutes, until golden brown. The original recipe calls for a cream cheese icing, which I skipped. I prefer my sweets not too saccharine and this bread is still delicious without the icing. But feel free to drizzle it if you desire. The bread is the tastiest when it is eaten warm, and best served the day it is baked. Otherwise, wrap tightly in plastic wrap and share with your friends (also optional). 1. In a large mixing bowl, combine 2 cups of the flour, sugar, yeast, and salt. Set aside. In a small saucepan heat milk and butter over low heat until the butter is just melted. Remove from heat, add water, and set aside for about a minute until the temperature registers 120F-130F, add vanilla. 2. Pour the milk mixture over the dry mixture and combine with a rubber spatula. Mixing by hand, add eggs one at a time (a stand mixer can be used, with a dough hook). This is the trickiest part, it may look like a big shaggy mess, but continue mixing until it is all incorporated. Add 1/2 cup flour and mix until smooth (30-45 seconds). Add remaining flour, 2 tablespoons at a time and knead until smooth and sticky (the dough will be very sticky, resist the urge to add more flour). 3. Place the dough in a large, greased bowl, cover with plastic wrap and allow to rise in a warm place until doubled in size, about 1 hour. Deflate the dough. At this point you can either pop the dough in the refrigerator overnight and resume in the morning, or if you can tackle the dough now (the dough is very sticky and it will be difficult to shape and roll out, so it's best to chill it a bit). 4. In a small bowl rub sugar for the filling with the zest of the lemons with your fingers. 5. On a lightly floured work surface roll out the dough into roughly a 12 X 20 inch rectangle (erring on the side of smaller is okay here as the finished dough will rises considerably, filling in any gaps). Using a pastry brush spread all of the melted butter over the dough. Cut the dough up to down in strips (12 X 4 inch pieces). 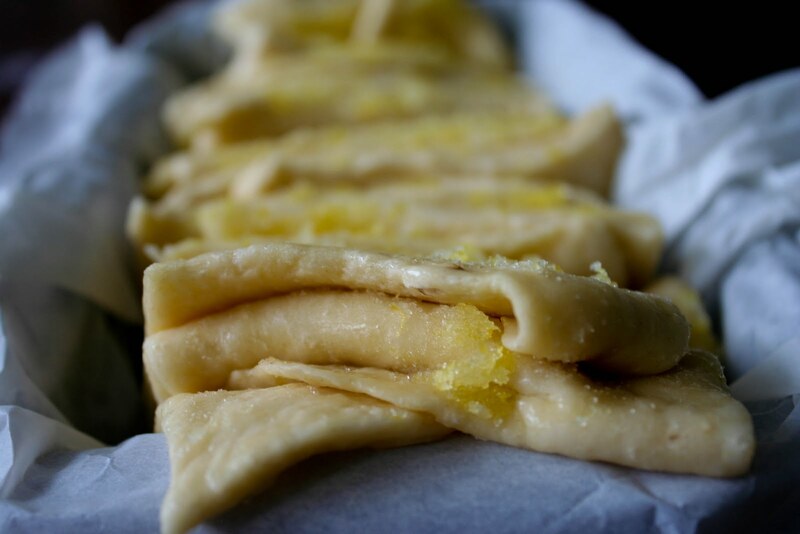 Spread 1/5 of the lemon zest mixture onto a rectangle of dough, stack another rectangle on top and repeat. 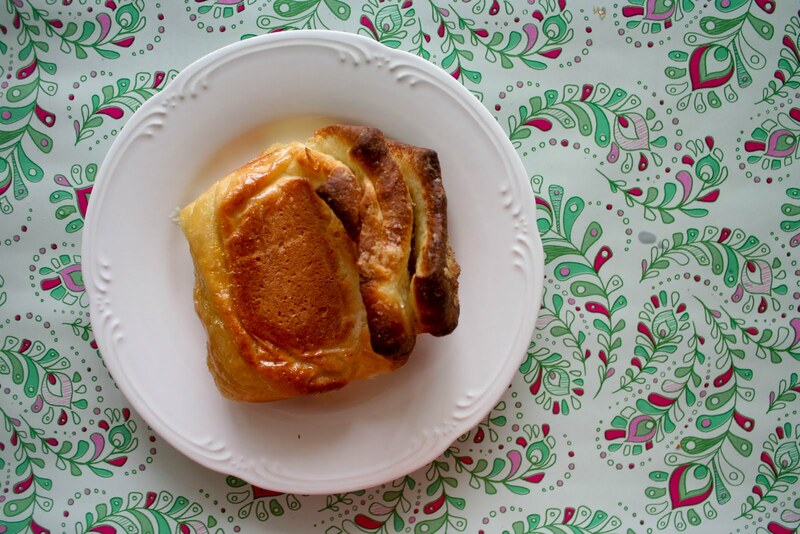 You can reshape the dough as needed to make a good looking stack. 6. Preheat the oven to 350°F and place rack in the center. Lightly grease a 9 X 5 loaf pan or line with parchment paper leaving 1 inch ends to hang from pan so the bread will be easier to take out later. 7. Slice the stack through the five layers into 6 equal sections, about 2 X 4 inches. Fit the layered strip into the loaf pan, cut side down…as if it were a loaf of pre-sliced bread. Cover the pan in plastic and allow to rise another 45-50 minutes until nearly doubled in size. If you poke the dough and the indentation stays it is ready to bake. 8. Bake until the top is golden brown, about 30-35 minutes. Cool for 10-15 minutes, invert loaf pan gently to release bread or pull out with parchment paper. 9. Optional: Make glaze. Stir cream cheese until smooth. Add lemon juice and powdered sugar, combine. Drizzle over bread. 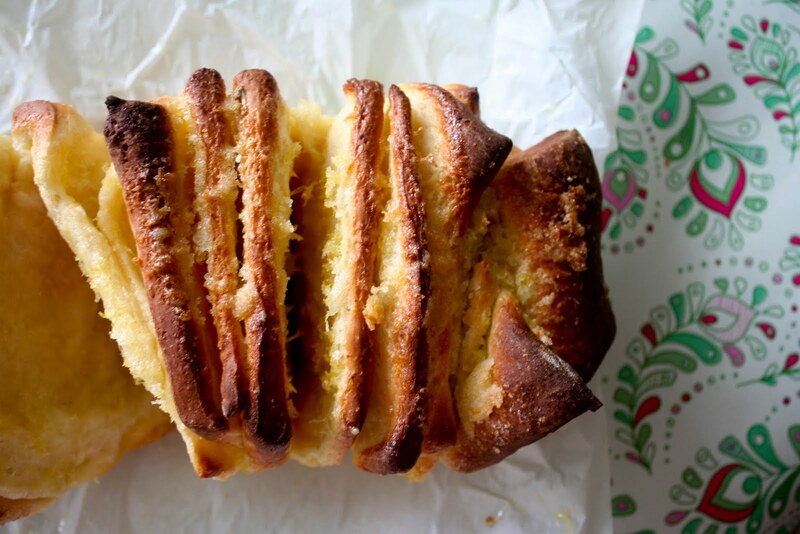 Gorgeous :) It doesnt matter how many times I see pull-apart bread on the web, it doesnt lose its charm. So moorish looking, i think id have a hard time resisting taking slice..after slice..(anything with lemon and its a big thumbs up from me!) Your photos are really pretty too, altogether lovely post! Yum! The lemon sounds especially delicious! 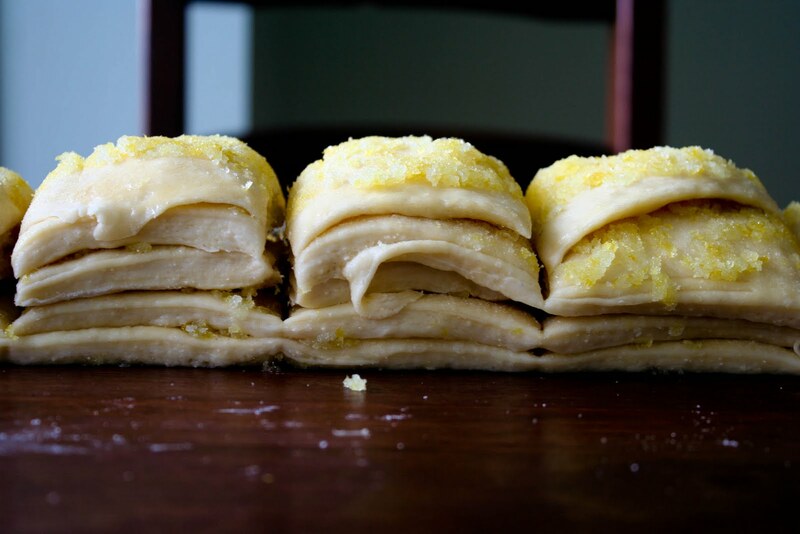 And I love the picture of the stacks of dough with the lemon sugar in between and on top. Looks so good! Ooo! I can't wait to try this. 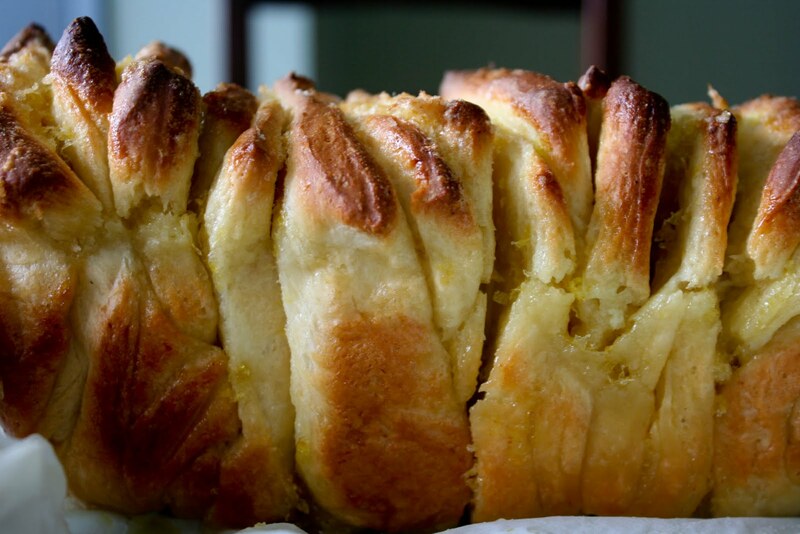 It seems like the lemon version of monkey bread. Yum! I only have two lemons, but I have lemon oil...think I could sub some of that in, since that's the main thrust of the zest anyway, and if so how much would you guess should be used? That's a very good question. I've never used lemon oil before, so I don't know how strong it is. However, based on this http://www.foodsubs.com/Extracts.html, 2 teaspoons of zest should be substituted with 1 teaspoon of lemon oil. 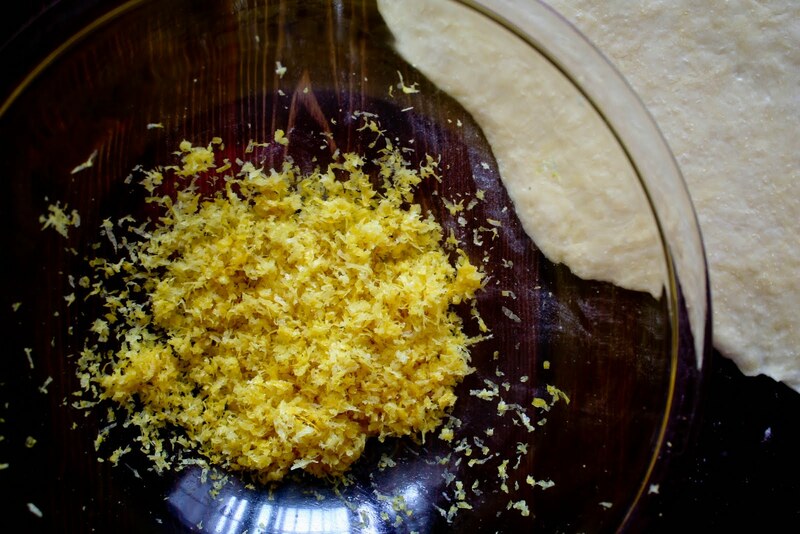 This means you should use only 2 extra teaspoons of lemon oil if you want to subtitute for 4 teaspoon of lemon zest (since you only have 2 lemons on hand and the recipe calls for the zest of 6 lemons). Let me know how it goes! I'm curious to see how it turns out. This was awesome. I took this to a brunch this morning - it was perfect. Thank you for a great post!